There are numerous of websites who offer free fonts but only handful of them are good. And 1001 free fonts is one of the best among them. So if you are searching free fonts for the personal and commercial use you can definitely review this website. However, for the commercial purpose, you might have to pay but for personal use, these are completely free. We don’t know the exact numbers of available fonts. Because numbers are not mentioned but they have 1978 pages and each page is full of different fonts. An approximately they have 20,000 unique fonts available and the number keeps increasing. Including some of the popular fonts like Decorative, fantasy, ice snow, gothic, calligraphy, Christmas, Rockstone, and much more. Site not only provide free fonts to the users but also beneficial for designers as well. It offers the platform to the designer to promote the new font in the market. How to download font from 1001 free fonts? Visite their website www.1001freefonts.com and browse the font through category or if you know the name of font then you can search directly through search bar. You can also serch font throught most downlaod or newest category. Once you select your desired font you would be able to see some more details like designer name, license type, file size and their website. Before downloading the file you can review the font with your desired text. Just enter the text in “custom font preview” box and select the size, quantity and color of fonts and click on update button. All the fonts will appear with your customize settings. The last step is to click on download button and you will get your setup file in a zip folder. Which you first need to extract and then you can install in to your computer. The site is not only famous for free fonts but it is quiet popular among the designers to promote the fonts. The first requisite to submit the font is that you should be the sole owner of the fonts. On top left of the website you will find a button of submit fonts. Click on that tab and a online form will appear. Where you need to supply the details like email address, font name, font designer, website URL, font category , commercial license url, additional notes if you want and final upload the zip file of your font. Now click on submit and your request will go under scrunity where they will review your request. Once your font is approved they will inform you via email and your font would be live on their website. The site provides free fonts but that does not mean all he fonts which are available would be completely free. It all depends the type of license they have choosen. In some cases you would also find fonts with license of demo, donationware, public domain, and shareware. If you are searching fonts for personal use then you will find 90% of the fonts are free whereas rest are under shareware and other categories . On the other hand if you are looking for commercial purpose then you have to pay. And you can collect the information directly through commercial link. Despite the fonts are free you still can pay designer through donate option. If you think that designers deserve monetary compensation for it’s efforts. 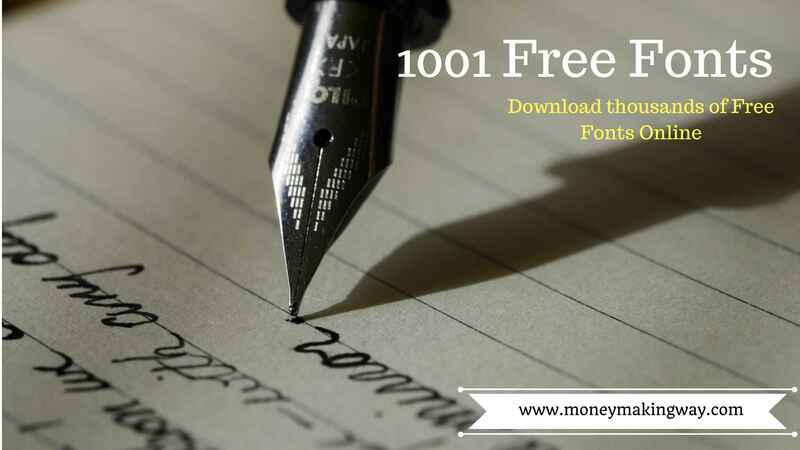 1001 free fonts is popular site to download free fonts. No registration is required for downlaoding or submting a new font. you can also check the preview in your desired texts before downlaoding. Apart from offering new fonts site also provides platform to the designers to promote the new font wihout any charge.